This past November, my sweet man took me to New Mexico for a couple days of relaxation and spiritual healing. Best birthday surprise. I did not know what to expect, but I was shocked at how charming and calming the city of Taos, New Mexico was. About an hour north of Albuquerque, Taos is a tiny town most known as a ski destination. We were there right before the winter influx of tourists coming to hit the slopes, so we enjoyed a relatively quiet couple of days. It was also CHILLY in early November, so I definitely recommend bundling up if you make the trip around that time. The change in altitude may also affect some, but we were fine during our trip. We stayed in Taos half of our stay and ventured to a secluded, epic mineral pool spa in the middle of the mountains to end our trip. Honestly magical. Here are my recommendations on what to do, where to stay, and where to eat. Highly recommend for a fun and unique couple's getaway or girls' trip. El Monte Sagrado was FANTASTIC. Great front desk service and beautiful grounds with suites and lodges. Our room had a working fireplace, little porch, and fantastic bathroom (important!!). They have a full spa to enjoy as well as a saltwater pool and hot tub. It is also a close walk to a town square full of little shops and cafes. A quick drive or walk from our hotel, the town square was CUTE. Grab a coffee and walk into all the little small businesses for sure. I bustled into a little boutique called Michelle's with an incredibly welcoming owner and bought a hat and coat that I will wear a million times over. Many owners sold local Native American art and trinkets and I wanted to stay there the whole day! One thing about food in New Mexico - it's GOOD. It's HEARTY. And if you go to breakfast at Taos Diner, it is cheap and filling and full of CHEESE. I am pretty much lactose intolerant, but i had to have a New Mexican breakfast platter before I left. The ambience is very casual and local and there's a ton of art on the walls. No frills, quick and kind service. 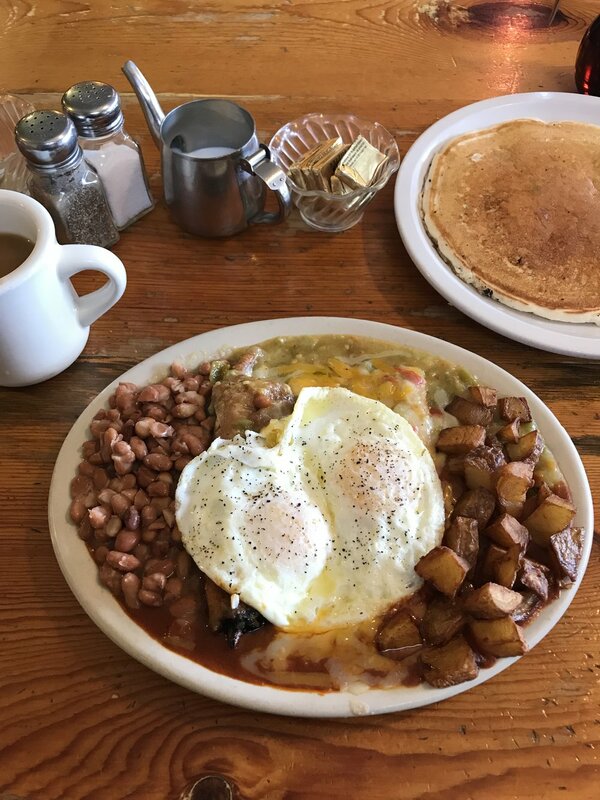 Get the eggs and chile, CHRISTMAS style (red and green chile mix). We made reservations here for my birthday dinner. The restaurant is a converted chapel so the architecture and decor is extremely romantic and historic. The interior is white with rustic decor, candles everywhere, and antique mirrors on the walls. My kind of restaurant! All the food we ordered was delicious and perfect for an intimate dinner. Food is local with Northern New Mexico flavors. Definitely make reservations, seats fill up quick. The end of our trip invoved going to Ojo Caliente, about 40 minutes outside of Taos. NO REGRETS. This place was on a different spiritual level. It is an outdoor spa with tons of mineral pools set at certain water temperatures, from warm to hot hot hot. We soaked in an arsenic pool, soda pool, iron pool, lithium pool, and mud baths. Each pool provides a different healing power, whether it aids in digestion, blood flow, muscle tension, etc. Despite the cold weather, the pools were so warm that you barely noticed it. If I make one recommendation, it is to go here for a day trip - they have day passes at reasonable rates.